Consecrated in 1185 - round shape (standard for Templar churches of this period, probably referred to the shape of the Holy Sepulcher Church in Jerusalem, where the Templars were founded) . 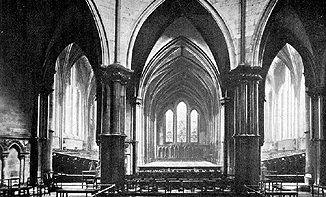 Extensive use of dark "Purbeck marble" in interior. Extensively restored in the 19th Century. Note that some of the Purbeck Marble had faded in the earlier view. 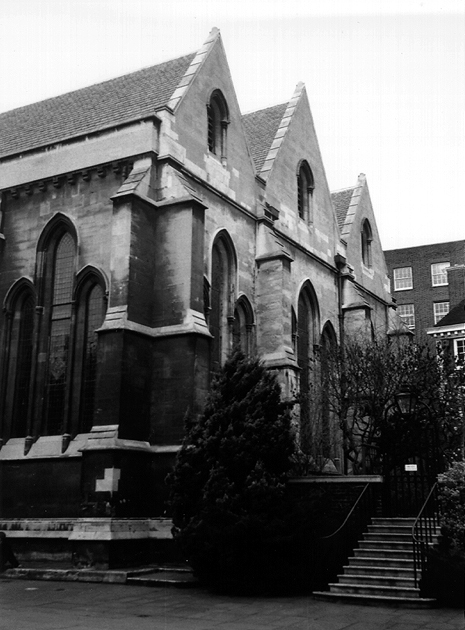 Addison, G.G., The Temple Church. London, 1843. Baylis, T.H. The Temple Church and the Chapel of St. Anne. London, 1893. Billings, R.W. 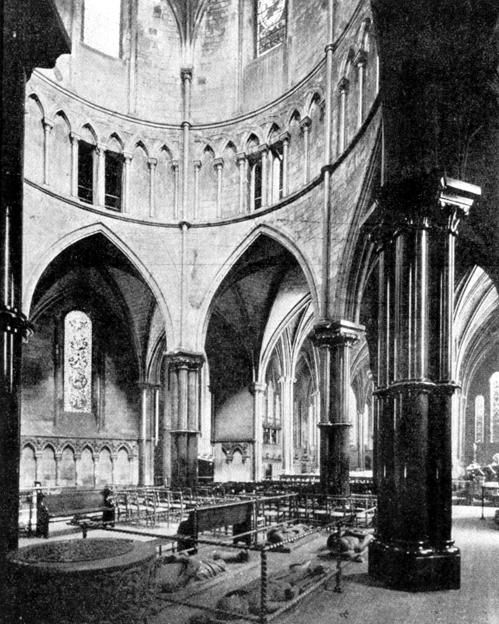 Architectural Illustrations and Account of the Temple Church, London. London, 1838. 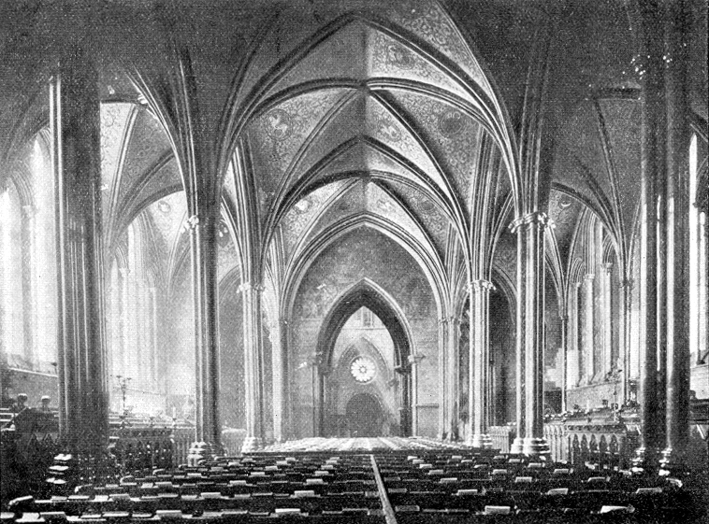 Dove, W. "The Temple Church and its Restoration." In Transactions of the London and Middlesex Archeological Society, 1967, pp 164-72. Essex, W. and S. Smike. 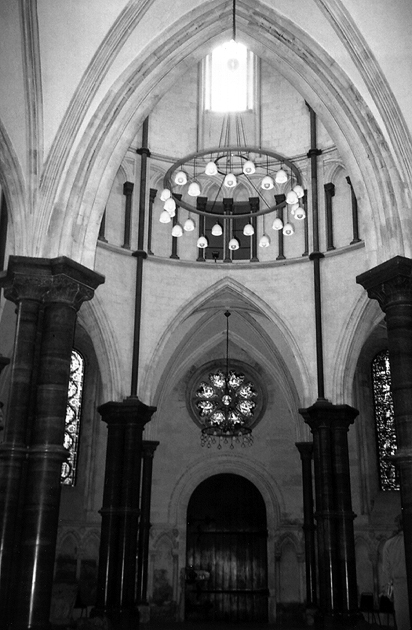 The Architectural Embellishments and Painted Glass of the Temple Church, London. London, 1845. Gardam, C.L.M. 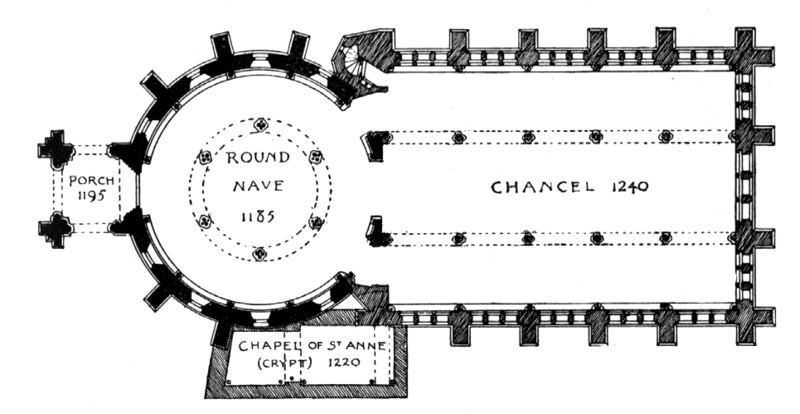 "Restorations of the Temple Church, London"Iin Medieval Art, Architecture and Archeology in London , edited by Lindy Grant. The British Archeological Association Conference Transactions For the Year 1984. Leeds, Manley and Son, 1990. Pages 101-117. Godfrey, W.H. 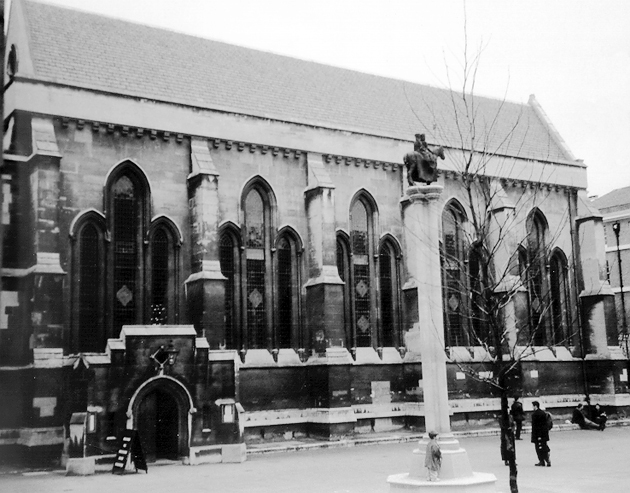 "Recent Discoveries at the Temple, London, and Nones on the Topography of the Site." Archaeologica, XCV, 1953. Herd, C.O. 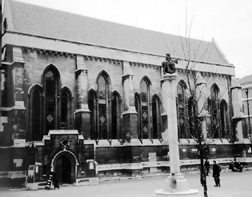 Notes on the Restoration of the Temple Church (1185-1240). London, 1956. 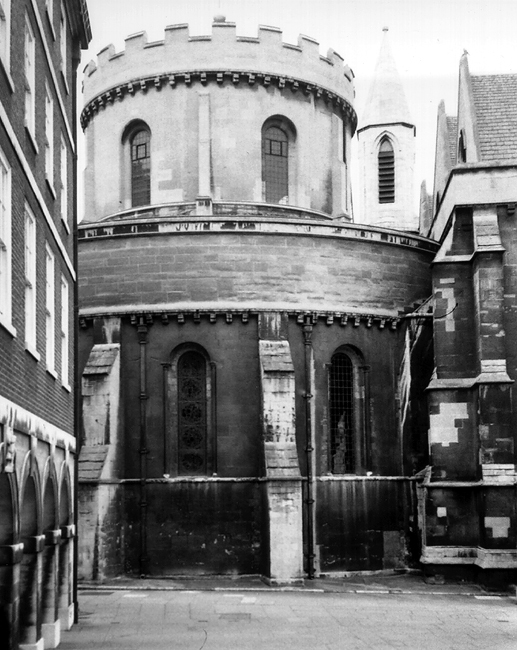 ___________ "Restoration and the Temple Church," Transactions, Ancient Monuments Society, New Series XVI (London 1968-9), 23-31. Mordant Crook, J. 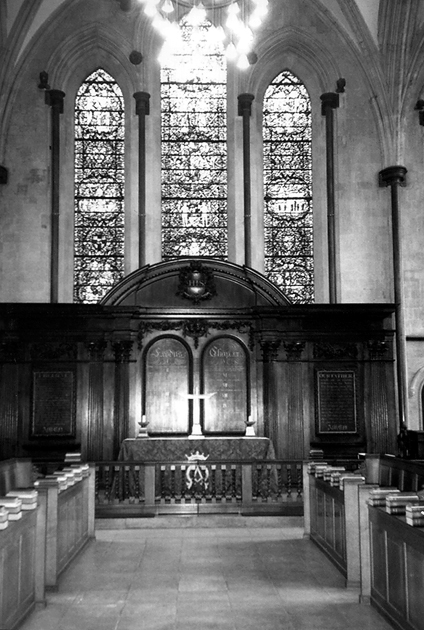 "The Restoration of the Temple Church: Ecclesiology and Recrimination." Journal of the Society of Architectural Historians (British) VIII , 1965. 39-51. St. Aubynm J.P. "An Account of the Repairs at the Temple Church." Transactions of the Royal Insatitute of British Architects, 1864. Pages 153-5. 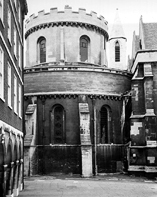 Williamson, P. "The West Doorway of the Temple Church, London." Burlington Magazine, CXXVII (October, 1985), 716. Zarnecki, G. "The West Doorway of the Temple Church in London. " Beiträge zur Kunst des Mittlealters, Festschrift für Hans Wentzel zum 60 Geburtstag. Berlin, 1975. Pages 246-53.